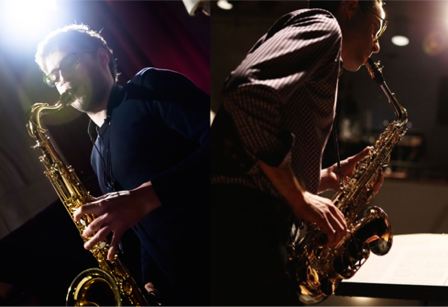 "ANAGRAM" - The Landman/Stadler Saxophone Duo presents a concert of works for all combinations of saxophone duo. From American composer William Dougherty's "that feeling in your jaw", for sopranino and soprano saxophones (the two smallest instruments of the family), to Australian/Swiss composer Paul Clift's powerful "duet/anagram" for two tenor saxophones and electronics, this program showcases the wide-ranging possibilities of the saxophone duo. Additional pieces on the program include Spanish composer Matias Far's "El poeta", a world premiere work from Argentine composer and Harvard-resident Fernando Manassero, as well as works from Swiss composers Katharina Rosenberger and Dieter Ammann.